Now you can test your 3D model (digital prototype) in a virtual wind tunnel, directly inside the CAD application Autodesk Inventor Professional. The add-on utility "Project Falcon" from Autodesk Labs, released in August 2011 for Autodesk Alias and in August 2012 as a standalone version for Windows and Mac, is now available alsi as a plug-in module for Inventor 2013. And as every app from Autodesk Labs, this "technology preview" is available for free. 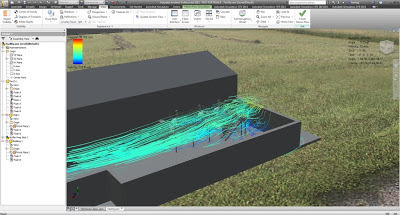 Thanks to this simulation tool you can analyze air flow around vehicles, buildings, outdoor equipment, consumer products, or other 3D objects designed in Inventor or brought into Inventor as 3D CAD data. Simulation results update almost in real-time in response to changes in wind direction and speed. Visualization tools in Project Falcon include 2D and 3D flow lines, shaded result planes, vector plots, and surface pressure shading. Quantified outputs include velocity, pressure, drag force, and drag coefficient. The computation process is based on a transient, incompressible fluid flow solver and LES turbulence model and delivers quick results with very little setup on behalf of the user.